Ethereum was the pick of the crop over the last 24 hours, following a dismal week which saw $ETH drop to a new yearly low of $171. Just when the haters were celebrating the death of the #2 cryptocurrency, $ETH surged up to $220. $ETH has since dropped to $213 as shorters take advantage of the price boost. However $ETH still sees a 13% increase in price over the last 24 hours. Market Cap has seen a slight increase, breaking over $200 billion and sitting at $202 billion following the weekly low of $186 billion. Green all around sees $ETH taking the top spot with a massive 13% gain in price. $EOS takes second place with 7.64% followed by $BCH with 5.69% growth. 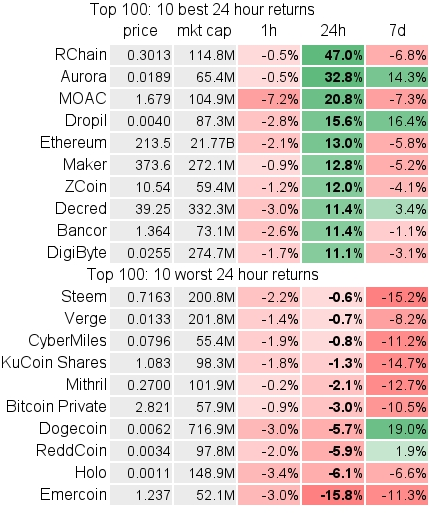 The remainder of the top 10 all see slight gains over the past 24 hours. Emercoin sees the biggest drop within the top 100 coins, dropping 15.10% in price and slipping to #99 on the top 100.